It may be a borderline sacrilege to say this about the 27th Steven Spielberg-directed movie – and the fourth one starring Tom Hanks — but it’s true: this is a disappointing film. It starts so slowly and disjointedly that it lost me at the beginning – and never (for me, at least) fully recovered its sense of momentum, never really got me involved. It’s inspired by true events, with characters based on real people, so it’s a compelling story; it’s just that the performances, in general, are not very convincing. In a very long list of Spielberg movies I’ve loved – even admired — this one is very low on the list. It feels like it keeps dragging its way forward to a conclusion that those of us who remember the newspaper headlines, already know. We begin in Brooklyn in 1957 with a very long, mostly wordless, drawn-out sequence that results in the capture of Rudolph Abel (Mark Rylance) a suspected Soviet spy. He receives his coded messages in a hollow U.S. nickel. This is the era of the Cold War when fear and hatred of the “evil Red empire” run high; Abel must be given a fair trial, he must be defended by a competent lawyer – but who will take a case like this? 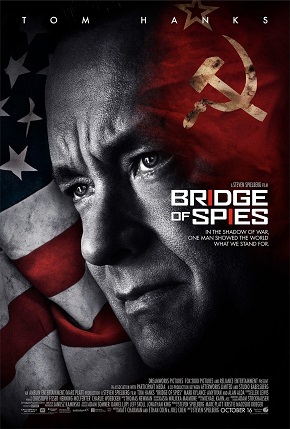 Enter James B. Donovan (Tom Hanks) who’s reluctant to get involved; he’s afraid that he and his family will be targets for the country’s paranoia. An hour into the movie, we finally meet the American spy – Francis Gary Powers (Austin Stowell) – whose spy plane is shot down over Russia and for whom the Soviets will be willing to trade to get Abel back. We never learn much about him and so we never really care about him. The movie does get better as it goes along. Hanks plays the hero he loves to play, but the standout here is Rylance as Abel. He’s sad, he’s funny, he’s stoic, he’s empathetic – and he seems always to accept his fate. The ending is satisfying, conclusive and even mostly realistic. So there is a great and suspenseful and essentially true story being told here and Spielberg – one of the world’s great storytellers – is telling it. But all along the way, I had the feeling that it could have been told better.